Mobikwik–}Get Rs.25 Cashback For Transfer 5th Transaction of Rs.5000 And( + 5 time Earn Money 125) Mobikwik has Launch UPI Offer For Available Only UPI Transaction Get Rs.25 Cashback 5 Tim’s UPI Transaction to Any @ikwik VPA.once user Available this offer. Maximum 5th Times during. Maximum cashback Rs.125 Received You. So Enjoy This Offer Hurry UP. 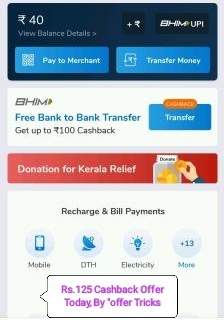 How To Get Rs.125 Cashback For Mobikwik UPI Offer. 3.sign up /And Login your Mobikwik Account. And Verify Your Mobile Number or Get Started Your BHIM UPI Account. 6. And You Will Get Rs.25 Cashback Your 5 Transaction Successful. And You Can Available this Offer Use of 5th Times. And Get Rs.125 Cashback Received. Get 5th Transaction Successful Of MBK UPI ikwik)Handle. Once User Use 5 Times. Mix Cashback One can Earn Is Rs.25 Cashback Received. Maximum Transaction This offer Use Rs.5000 Available. Offer Valid For 9th November to 30 November 2018.